The Wizard Series Material offers a .28mm double coating of PVC with tough nylon scrim material layered in between. The Nylon Scrim has excellent rip and puncture resistance. 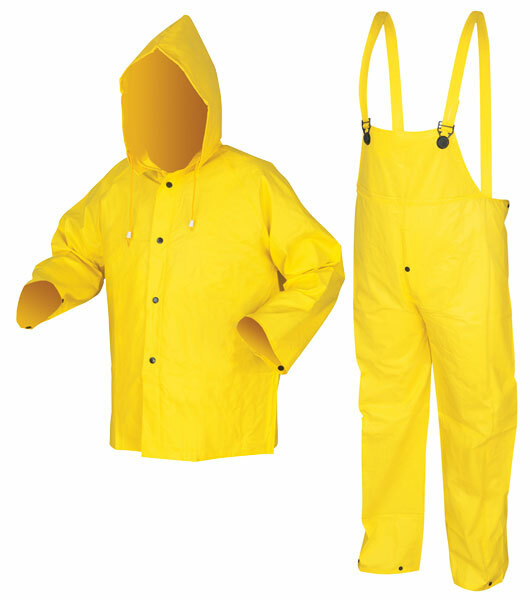 The 3003 yellow three pc suit that features a jacket with hood and bib style pants. The jacket offers a storm fly front with snaps, take up snaps at the wrists, and a detachable hood with drawstring. Bib pants feature a fly front with snap and take up snaps at the waist and ankles. Limited flammability, NOT intended for use as protection against ARC Flash or Flash Fire. For more information on Limited Flammability, Click Here.